Bat Guano Organic Fertilizer is an aged product of nature. It may be added to the soil at any time during the year when soil is not frozen. The use of Bat Guano as a fertilizer contributes to healthier and stronger development of stems, leaves, and seeds in just about any plant and produces beautiful flowers! Bat Guano Organic Fertilizer can maximize your plant life and has many uses. When building a compost pile, from time to time, simply dust a light layer of Bat Guano Fertilizer over the growing pile. When potting plants, use one teaspoon for each pint of potted soil; for plants already growing in pots, work Bat Guano Fertilizer into the surface soil, or mix well into the new soil if repotting plants. 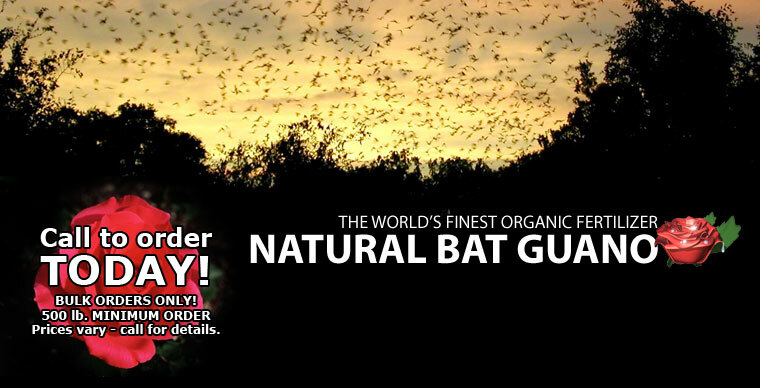 Bat Guano Organic Fertilizer is safe for use outside, too. Use one tablespoon of Bat Guano for each inch of shrub height. Apply Guano around the base of the plant and work it into the soil. For gardening, apply 5 pounds of Bat Guano for every 100 square feet or more of garden area and lightly work the Guano into the soil. Of course, taste is subjective, but most people agree that organically fertilized foods are much tastier! Also, get greener, fuller grass by scattering Guano lightly over your lawn! For ordering information, call us today! Our guano is harvested from our natural cave in West Central Texas.